There was an article in the Gainesville Sun recently about vacant restaurant and retail locations throughout the city. Mike Ryals, a realtor with Bosshardt Realty Services, has been showing some of these properties and claims that while some vacant restaurant locations around Archer Road have been getting some visits, they’ve “had trouble finding interest” for others, like the old Melting Pot downtown. According to Mike, “’It has to be someone who wants to be downtown. It’s a niche market’”. To me, this was a funny thing to say. Doesn’t everyone want to be downtown? That’s basic land rent theory – closer to the center of a city, lots get smaller and rent goes up because demand is high. And what’s this about a niche market? A downtown central business district is the economic hub for the entire city, and is important for all of its consumers, rich and poor, visitors and residents. With such a diverse crowd, you’d expect there’d be a market for everything. That’s why rents are highest, because downtown is the best place to sell your goods. But theory is often flawed. So I decided to find out what this “niche market” was exactly, if there is one at all. My method was a handy online GIS tool from ESRI: Business Analyst Online. In short, users can define geographic areas and compare them with a wealth of economic, demographic, and transportation data. Simply enough, I compared downtown Gainesville to the whole of the metropolitan area for several of these statistics, as well as their Tapestry demographics (which I’ll get into later) to try to tease out differences and discover a possible “niche”. The first step was defining downtown. There’s no definition for it, of course. But just from having lived in Gainesville for about five years (two of those downtown) I would say it’s characterized by densely placed bars and clubs; old warehouses converted to restaurants, and other redevelopment; historic neighborhoods; and government buildings. Or, in spatial terms, roughly from W 6th Street to E 9th Street, and Depot Ave. to N 8th Ave. On the BAO map, I placed a point roughly in the center of this rectangle, at University Ave and E 3rd Street. From here, users can define three rings of varying size extending from their point and use these as their geographic areas from which to derive data. Thus, I can define “downtown” by three areas of varying size, which is useful since there isn’t a clear definition of it. 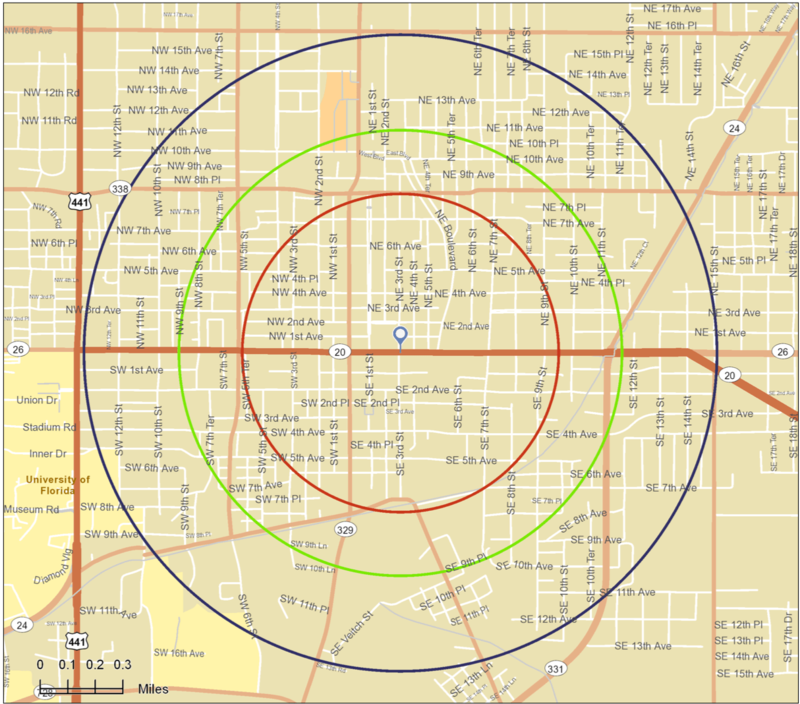 My three circles had radii of 0.5, 0.7, and 1.0 miles from the centerpoint. With downtown (or versions of downtown) defined, it was time to define the Gainesville metropolitan area I would compare it to. For this, I simply used all of Alachua county. It isn’t a continuous urbanized area, but Gainesville’s satellite towns, and all other parts of the county, are certainly part of its market area as well as its Metropolitan Statistical Area (which also includes Gilchrist county, but I feel that’s a bit of a stretch). Several things are interesting about these numbers. The downtown median age is almost exactly the same as the rest of the metropolitan area, except for the one-mile ring, which is lower because it encompasses part of campus (frat and sorority rows) and a lot of mainstream student housing. Yet, despite a lack of significant difference in median age, there’s a huge disparity in income between downtown and the rest of the MSA. And that can’t be solely explained by a greater population of students, since downtown is only a little younger. So, it may simply be poorer. This is supported by data regarding per capita consumption, which ESRI provides an estimation for in a wide variety of relatively specific categories, from televisions to dairy products to mortgage payments. In every single category, Greater Gainesville spends more than downtown, for all three rings – by anywhere from a third to two thirds more. So was Mike Ryals just being polite by saying downtown had few prospective business visitors because they are a “niche market”, when really he just meant they are poor? That’s possible. But less-than-median-income isn’t a “niche”. In many ways, it could be the most mainstream market in America – think of Walmart, McDonald’s, Dollar Store, and every other crummy retail franchise with the cheapest goods. Yet none of those are to be found downtown. Income is part of the equation, but there’s more – consumer preference. Measuring consumer preference can’t be easy, but ESRI has managed to do it to some degree through the use of “Tapestries”. These consist of sixty different “segments” of people in America, based on their demographic and socioeconomic characteristics. Like median age, median income, and consumer spending, they can be calculated by the geographic area of the user’s choosing. By anecdotal experience, I can say that I found ESRI’s tapestry statistics to be quite accurate – I can picture most of these types in Gainesville as described, including for myself. The tapestry of the inner downtown ring (0.5 mile radius) is remarkably concentrated: 58% are in the “College Towns” segment. Most people in this segment are students, but they aren’t the youngest segment of adults, so most likely they’re upperclassmen, graduate students, or recent graduates. They like fast and cheap food, they go out to bars and shows, if they work it’s in low-paying service jobs, and they spend a disproportionate amount of money on cell phones and laptops. The “Metro Renters” make up a further 22% of the inner downtown area. They’ve stuck around since graduation and have gotten white collar jobs. They don’t have children and probably aren’t married yet. They like to travel, read biz/fi magazines, go out to eat, and would rather listen to NPR than watch TV. Another top five tapestry in all three rings were “Great Expectations“. They’re a bit like metro renters but live more conservative lifestyles – they’re more likely to own a house and have a young family, shop at chain stores, and don’t care much for travel. This is one tapestry I couldn’t picture as well as the others as applied to downtown Gainesville. Rounding out the inner downtown crowd are the politically-correctly named “Modest Income Homes“. They are poor, most of them are black, they live in small houses or duplexes rather than apartments, are not likely to have internet access but enjoy watching TV and something ESRI calls “urban radio”. 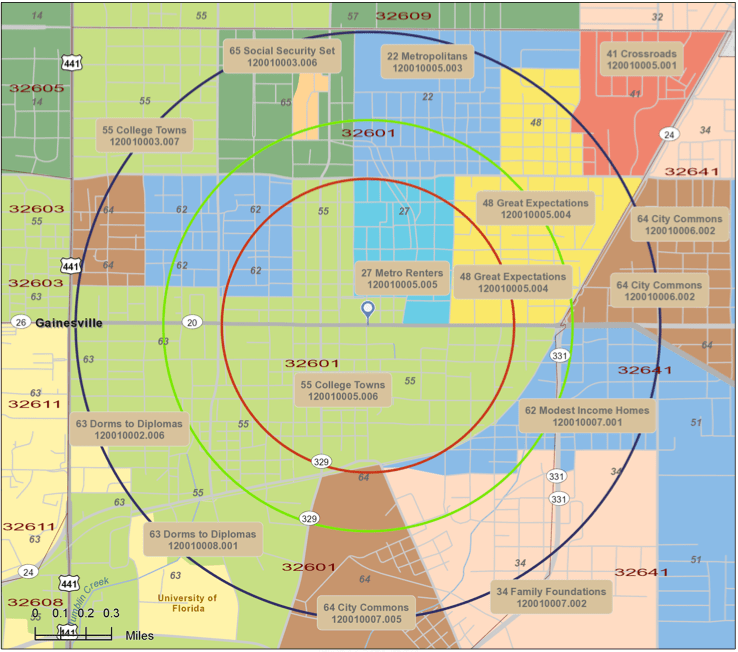 Briefly, two other groups that are larger segments in the two outer downtown rings are “Metropolitans“, who are essentially “Metro Renters” that have stayed on in Gainesville until middle age; and “Dorms to Diplomas“, who differ from “College Towns” in that they are younger and thus more likely to be underclassmen who have meal plans, live in dorms or frat houses and can’t drink in bars yet. The map below shows where these dominant tapestries are located downtown. What does it all add up to? The college segments, which represent about half of downtown’s population, provide demand for cheap and fast food, plentiful alcohol, entertainment, and technology stores. The next biggest segment, the “Metros”, will be a little more discerning in their tastes for food and drink and will want finer dining establishments, preferably not chains. They’ll share the demand for entertainment and tech stores. The low-income segment will consume the least, but will probably also be interested in inexpensive food and drink. And finally, the younger but more suburban-oriented folk in “Great Expectations” will be more interested in chain retail and restaurants than the others. With such a diverse group of consumers, does this really constitute a niche within the city? Compare to the rest of the Gainesville MSA/Alachua County, it kind of does. Because it’s a larger area, Alachua County contains more groups, in smaller proportions, with different preferences. Besides the segments present downtown, some of these include: “Midland Crowd“, “Prosperous Empty Nesters“, “Midlife Junction“, “In Style” (who are interesting because they have “Metropolitans” preferences but live in the ‘burbs), and many others. Finally, how does demand from downtown’s niche market match up with actual supply? Pretty well, but there are holes. Downtown certainly caters to the college and recently graduated segments through it’s plethora of bars, clubs, and music venues. For the more refined Metropolitans, there are quieter bars with craft beers, local fine dining, and the Hippodrome for theatre and foreign films. There are opportunities here, however. I am continually amazed at the lack of cheap, fast food downtown. The few establishments that do provide it have huge demand, especially at night. I can perhaps understand why chain fast food doesn’t locate downtown – franchises are usually a standard size with a parking lot, and parcels downtown aren’t big enough for that. But besides that, there’s definitely opportunity for more fast and cheap food. I can see additional opportunity for some tech stores. Gainesville probably doesn’t yet have the population to have an Apple Store, but a small cell phone store or computer repair shop would probably get brisk business. Again, the “Great Expectations” segment was a surprise to me, but their presence may indicate that more mainstream restaurant franchises or retail outlets have more potential downtown that perhaps one would realize. But parcel size may again explain the lack of these, as well as a close identification these stores have with Butler Plaza on the other side of town. So it appears Mike Ryals was right that downtown Gainesville does have a niche market, but wrong that that should scare away businesses from moving in. While not every type of business will work there, many have and continue to, and there’s even some untapped opportunity to spare.